We currently have some paint slots available over the winter months. If your boat/barge needs re-blacking or the superstructure needs re-painting give us a call or an email for a quotation. FREE crane and transport one way to our workshops with re-blacking and the superstructure re-painted. We have a fully fitted build slot become available in May 2019. Please call us for more details. A new addition to Bluewater Boats is our hydraulic wheelhouse, which can be fitted on our wide beams and our Dutch Barges. Please contact us for more information on 01926 811699. Shensi, our replica Dutch Barge, was delivered from Bluewater Boats in 2017, and from our first meeting with David and Sharon at Crick, we have never looked back or regretted our decision to engage them for our build – they were easy to talk to and understood what we were aiming for, and they have a great workforce to support their business. As I would imagine with most custom new-builds, our build was not without its challenges but Sharon and David took the time to work with us to achieve a barge to be proud of, after all this was to be our home and it needed to be functional and comfortable, and Nicki and I both agree that this was achieved in spades. We spent our first year on the Thames so that any snagging issues could be addressed for us in a timely fashion, and we have since moved on to Europe, where Shensi still lives up to our expectations. She handles well and is very comfortable, and we are often approached by passers-by expressing their admiration for her. Before, during and since Shensi’s build, we have always felt that we had a positive relationship with Bluewater Boats, and they have continued to be extremely helpful and supportive whenever we have had any questions or additional needs. All-in-all, Nicki and I have been very impressed with everyone at Bluewater Boats, and their attitude and commitment has given us great reassurance throughout the process. Well done Bluewater and thank you. It’s now been 14 months since we took delivery of Skylark and we are still loving the lifestyle she provides. It has been a very steep learning curve for us both, but we have got through it with the continued support from Bluewater Boats Ltd. As with every new build, we have had a couple of teething problems, but Bluewater Boats Ltd have always responded and assisted us where needed, a big thank you to you all. Skylark is still admired by people wherever she is moored. We are extremely lucky to be able to enjoy such a comfortable boat as our home and look forward to cruising the canals and rivers for many more months to come. For us there is no better way to unwind after a day at work, than to sit on the roof enjoying a glass of wine or beer whilst watching the beautiful sunsets, now that’s what we call living. And you can do it too, just contact Bluewater Boats Ltd and they will help you brings your dreams to life, just like us! Thank you both Trudy and Adrian for choosing Bluewater Boats to build your new home and thank you for your positive and lovely comments. We wish you a wonderful boating season in 2017 and we are pleased Skylark is everything you both dreamt of. Just back from a 5 hour meeting with Sharon and Dave planning the next stage of Where’s Ware? Build. Intense, fun, informative sums up the time. The whole team are all professionally helpful, creative and happy to change layouts around to suit our future lifestyle on our boat. If you as a prospective boat owner are reading this then look no further because Bluewater Boats are your answer to any boat build. Hi Sharon & Dave ( Kipper) We have now had our boat, Cheers, for about 18 month, we are very pleased with the boat, the quality of the workmanship and the design of the boat. Any small problems we have had have been sorted out as soon as possible. All your staff was very helpful from the start of the build to the finish and afterwards. We are very pleased to have your name on the boat, Built by Blue Water Boats of ladbroke. We would have no problem in recommending you to any perspective customers. Hope you have many more years building quality boats, Hope this years show was good for you and that you have a good open weekend. All the best Tony & Carol Wilkinson. 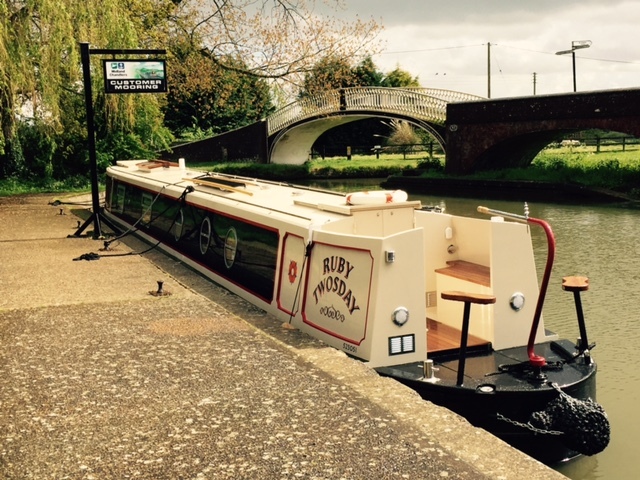 Our narrowboat, Elsie May was built by Bluewater Boats in 2011. We chose Bluewater because we liked the idea of a single boat builder doing everything from steelwork to the final fit-out and we were very impressed with the quality of the boats we saw being built. We made an excellent decision. We are delighted with Elsie May and she has provided us with many days of happy cruising. The build process went very well; Sharon and Dave and the rest of the team were a delight to work with; they were flexible in incorporating our design ideas into the boat and equally contributed their own suggestions too, which we appreciated as this is the first boat we have owned. We agreed that Elsie May could be displayed at the Crick Boat show before she was launched, and while this was somewhat stressful for us (having hundreds of visitors through our yet to be used boat! ), we were pleased to help Bluewater. We had only a handful of snagging issues and we had no difficulty getting these dealt with. Elsie May now has over cruising 1000 hours on the clock; she still looks great and is in excellent condition; a tribute to the quality of the build. We remain in contact with Sharon and Dave, and enjoy catching up with them periodically at either Crick or at the boatyard. We would thoroughly recommend Bluewater to anyone wanting a high quality bespoke narrowboat built. Just a quick e-mail to let you know we have arrived on the Mediterranean side of the Canal Du Midi ! The dream has become reality !!. Our Dutch Barge “Tell us Tomorrow” sailed out of Boston across the Wash and round the North Sea at the start of the summer to spend a few months on the Thames, then in late September 2015 we sailed it from Queenborough to Calais and then on down the canal and river system to the South of France. All this way trouble free, what a splendid job you made of the design, build and fit out. You both have to be congratulated on the shear high quality of the boat`s you produce. You should be very proud of the boats you build. We have seen many boats and barges along the way, but never anything to come close to what you have built. Many people have been invited aboard to look at this boat, and we actively promote your company over all others. We have added a solar system, the wheel house roof has eight flexible panels sown into the canvas with a state of the art controller that feeds around 45 amps into twelve deep cycle forklift truck batteries. This allows the use of all of the electrical appliances including the 1 Kw immersion heater without a shore line or the generator running. Also we have purchased a deck wash water pump that will be installed in the engine room that uses canal water for washing the boat down. My narrow boat is 13 years old.In the first few years I was plagued with rust pitting along the waterline which broke through within weeks of frequent blacking.I turned to Bluewater who shot blasted the hull and applied an epoxy blacking.Problem solved.She has just been out of the water some 4 or 5 years after the treatment and there was no sign any rusting.In fact I only had a coating applied largely for cosmetic purposes. We are the proud owners of a Bluewater Dutch barge replica “Kendra Erin” previously known as Charmor. While we are the 3rd owner, Bluewater have always answered any questions we have had. We would recommend their workmanship and finished product. Tuesday 26th January was a very exciting day for us as we took delivery of Skylark, our new home. However, the weather was horrendous and it was touch and go if she was going to be launched! Personnel from Bluewater Boats Ltd confirmed that it was the worst weather they had experienced when handing over a boat!! Everyone involved was extremely positive and with great determination, we finally got her on the water at Sharpness Shipyard, a very big THANK YOU to you all. We are now settled on the Gloucester & Sharpness canal, still experiencing horrendous weather, but we still have big smiles on our faces knowing this is the start of our dream and Bluewater Boats Ltd made it happen. We have had many people admiring Skylark, well who wouldn’t – she is gorgeous. Only the other day a couple out walking their dog stopped to chat to us about Skylark. They are hoping to have a boat built in a couple of years time, so we invited them on board for a quick tour. They were extremely impressed by the build quality and after an exchange of numbers, promised to return to enquire further about Bluewater Boats Ltd – watch this space David & Sharon! We are very excited as our wide-beam ‘Skylark’ will soon be completed by Bluewater Boats Limited, our launch date scheduled for January 26th. From our very first meeting we have been impressed by the professionalism, dedication, craftsmanship and knowledge of the whole team. The build quality throughout ‘Skylark’ is superb, with lots of attention to detail. Dave & Sharon have been on hand every step of the way, listening to our ideas, guiding us through the build process, giving valuable advise. In our opinion, we could not have chosen a better company to build our dream. Thank you all at Bluewater for our very classy vessel, she really is wonderful. Our narrowboat being built by Bluewater Boats will be completed in the next month. Unlike others, we didn’t do the rounds of other boat builders before choosing Bluewater Boats to construct our bespoke narrowboat. We simply went to Crick last year where we were extremely impressed by the quality of the workmanship on their show boat, and the novel treatment of the cratch in particular. By moving the water tank from its’ conventional position under the floor of the cratch, the floor is on the same level as the rest of the deck, thereby increasing the living space considerably. We have built on this idea further by extending the steel sides to within 3 feet of the bow, adding bespoke wooden framed windows which results in a lovely large sitting/dining area. All this and other novel features has involved much discussion with Dave, Sharon, Lucy and their colleagues. They have interpreted our ideas to perfection and with infinite patience and understanding. We are very impressed that they build everything themselves – the first time we visited there was just the base plate with a pile of steel by the side! We are so pleased we didn’t spend time visiting other boat yards. The boat will be on show at Crick this year and we will be proud to show you round! We chose Bluewater Boats to build our Dutch barge after looking at other builders, we thought they were the best then and still do. Liberty has been much admired especially in Holland. There are things we would change on the barge but the builder is not one of them. In hindsight an aluminium folding wheelhouse would be much easier and lighter to handle when the need arises to fold down the wheelhouse. Liberty was launched in October 2006 and has been our home since. We sailed her from Goole down to Ramsgate and then across to Neiuport in Belgium in April 2010. We always recommend Blue Water boats to anyone who asks, they were a good choice. What can I say? We are so excited about Ruby, she is looking so good and fingers crossed that Captain David will eventually decide on the hifi set up so we will be ready for Crick. Having a narrowboat built as Bluewater was a excellent experience from start to finish. They work to a very high standard paying attention to detail. We made a visit to see the build most weeks so we could se the work as it progressed. we use the boat as a live a board and are very pleased with the end results. They have a very good team of staff working on the boats. The boat was started on time and finished on time with good after sales service. We named the boat CHEERS. Where do I start? : I have been in the marine industry and I like to think I know a bit about boats! What I do know is a lot of people who are good with boats. There are many people in ur industry that are good at various aspects of the boat building trade, however their are not so many who are good in all aspects of boat building. On my quest for my own boat I looked at various boat types, many boat builders and when it came down to it the people that offered me what I wanted and needed was Bluewater boats. Always willing to offer the best advice, the most willing and able of craftsmen and above all an end product that is of the highest quality. In my mind if you are looking to invest in the future, look no further than Bluewater, anyone should feel free to contact me to expand on my experience. Dave and the Bluewater team built our widebeam “Pericles” six years ago and we remain absolutely delighted with the job they did. The boat was built as we wanted (with the wise advice of the team when our ideas were particularly impractical) and the workmanship is terrific – people still go wow when they come into the cabin. It functions really well both as a home and a holiday destination, and everything works as well now as it did when it was new. We took possession of our Dutch barge, Bolberry, in July 2007. People look at it now (2015) and think we have recently had it painted. In fact it is the original finish. The barge is everything we wanted. The only change I would make now, with hindsight, is to avoid the Webasto boiler. However, despite early difficulties with it, it now only needs an annual service and usually also needing a replacement burner tube every two years which I find a bit expensive. We generally only use the Webasto for 1.5 hours each day in the early mornings during winter. I would go to Bluewater Boats again if I were buying a new boat. My 63ft Narrowboat was launched at the Crick Boat Show in 2010 and spent the first two years on the Canals. The boat is now on the rivers in East Anglia, where in April 2014 she was surveyed for her first BSC. Having previously owned and hired boats I can categorically state that the building quality of the present boat is far superior to that of those before, beginning with the welding and ending with the interior woodwork. Even the surveyor made similar comments during his examination on board. The team at Ladbroke was, during the design and building phase, extremely helpful, competent and friendly. I wanted to include many unusual design ideas and probably caused quite a few headaches, but I never felt that there was any “attitude” during the many meetings with David, Sharon and the team. Now, after five years, I can happily say that I am still being looked after in the same way. And, most important, the boat is still in almost pristine, trouble-free condition. Thank you Bluewater Boats ! Having never previously owned or even been aboard a narrow boat or wide beam barge, we decided to do some stringent research on boat builders. After viewing a number of barges and visiting some boat builders, we where somewhat mesmerised by what the builders had on offer. Then Bluewater boats were recommended by someone who had previously had a boat built by them. We made an appointment to visit Bluewater and ever since the first phone call to Dave and Sharon we new we had chosen the builder for us. Because we live over a 100 miles away from Bluewater, visiting the yard during the build process was somewhat difficult, however we were kept informed on a regular basis whether by phone calls or emails. Dave and Sharon are a pleasure to deal with and nothing was to much trouble, they recommended what would be best but also accommodated our requests and extra work and built us our lovely home “Happidaze”.